Very happy to have finally copped a Ken Foster painting this weekend. 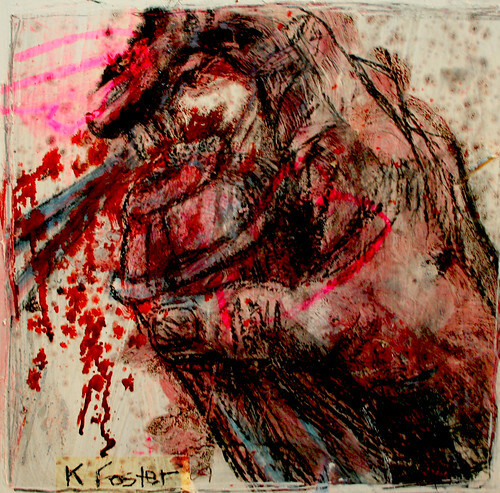 For those who don’t know him: Foster is a well-known artist from the Vancouver’s Downtown Eastside. According to his daughter, he has been diagnosed as having schizophrenia and turns to drugs, including crack cocaine, to self-medicate. He has produced roughly three paintings a day for the last 20-odd years. It’s more interactive and has more life this way, more character. It’s not just a static canvas. I don’t like interacting with stores where they give you a receipt. A brand new canvas is strange to work with, whereas the things I use have a lot of life to them. For example, if you use an old kitchen cabinet door, then, someone for like 30 years has been opening and closing this door with their dinner plates behind it. Now you’ve got it and you’re holding it against your chest trying to make some kind of image on it. I think it affects how you create and what you do. I like it, but some people don’t. Many times people have said to me that they would have bought my art if it were on a canvas. Paintings of DTES alleys have become his signature, their buildings and utility poles stark against soft light streaming in. He does a lot of hip-hop stuff too. He often sells his work on the street for $20, $30. People commission him to do plenty of work, sometimes for hundreds a piece. His hustle is admirable. He’s often found hawking his paintings in front of The Cambie in Gastown, east to Maple Tree Square where the statue of Gassy Jack stands. I had meant to commission three works from Foster last year — with an idea to hang them side by side above my couch, as the focal point in my shoebox apartment — but things got in the way, as life usually goes, and it never happened. Which is why I was happy to see him heading in my direction, painting in hand, in Maple Tree Square. I asked how much he was selling this particular piece for and he said between $20 and $2,500. (We settled on $30.) I asked which alley this was in particular, and he said Blood Alley, with the building on the right being the back of the Lamplighter pub. He said the buildings might not be geometrically accurate, but he painted that alley at that moment because he liked the way the light hit it. I like that bits of the original material, a McDonald’s ad, show through, helping colour this kind of bittersweet sunset. The hipster trap -- actually an art installation in New York City. Includes American Spirit cigarettes, a can of PBR, plastic glasses and a brightly-colored bike chain.